In a 2007 study, David Green and Craig Riddell, economists at the University of British Columbia, investigated the distribution of literacy skills in the Canadian-born population and how those skills are generated. Green and Riddell note that literacy skills play a fundamental role in enabling individuals to function to their full capability in society and in the economy. Without literacy, individuals cannot take a full and equal role in social and political discourse: they become less than equal members of society without the basic tools required to pursue their goals. Thus, they argue, in any attempt to build a better society, the distribution and generation of literacy is of fundamental importance. The Conference Board of Canada reports that 40 % of Canadian adults have literacy skills too low to be fully competent in most jobs in our modern economy. This data stems from the International Adult Literacy Survey (IALS), first conducted in 1994, wherein three categories of literacy were tested: Prose (new stories, fiction), Document (job applications, forms) and Quantitative (balance a cheque book, calculate a tip). These tests do not include the more recent requirements of social media and multiple software platforms, now part of our daily routine. In our home communities, we can partner with Literacy Groups and Government departments to help improve the literacy of residents. 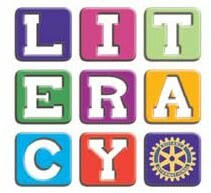 For those wanting to learn more about RI’s international literacy and education based projects, refer to https://www.rotary.org/en/our-causes/supporting-education or the Literacy Rotarian Action Group at www.litrag.org.